Communicating with clients is a daily discussion by company leaders across the globe. What often doesn’t get as much attention — yet can be equally important to business success — is communication between employees. Good internal communication has countless benefits. It fosters a strong culture, improves collaboration, streamlines results and can even improve morale. 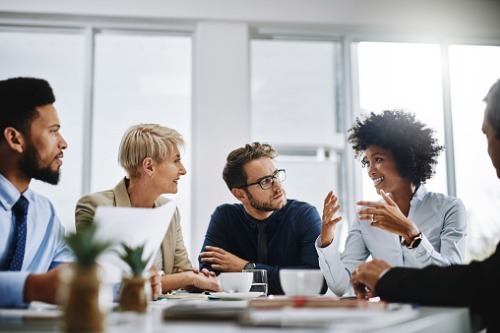 In today’s diverse business landscape, creating clear communication channels can overcome generational, gender and cultural differences to create cohesive teams and ultimately, successful outcomes. The daily banter around the water cooler is more than just casual socialization. Company leaders can better know their employees by participating in idle conversation from time to time. A pleasant greeting and genuine interest about an employee’s interests outside of work can provide amazing insight plus bring teams much closer together. Strive to be present and focused when in conversation. Listen more carefully, so you can respond more thoughtfully. It is important to think about who you’re talking to, even before your conversation, so you feel prepared and can minimize misunderstandings. Respect should be at the heart of all communication. Communication training is a worthwhile investment for companies. Many nuances of communication are unclear, and specialized training will help all employees understand each other better while clearly laying out expectations. This is important when onboarding employees but is also valuable from time to time as a refresher for everyone. Cater lunch, incorporate some team exercises and make it fun! Most co-workers use legacy methods of communication, which can cause confusion. It’s incredibly easy to misinterpret an email or text! However, emails, phone calls and texts make up 75 percent of all communications with co-workers, according to technalysis research. Bring teams together with modern communication tools like Skype, Google Hangouts or other video conferencing technologies. What’s more, ask teams how they prefer to communicate and adopt methods that work best. Constructive criticism is important for maintaining effective internal communication plans. Employees should feel comfortable communicating their concerns to their supervisors and HR. Maintain an open-door, no-judgment policy. Develop a process for evaluating any issues and developing solutions. Not only does this help build company-wide trust, but it also can provide valuable insight into improving the workplace. Research shows that companies with strong communication are rewarded in many ways. Employees that feel respected through solid, open communication are loyal, engaged and even more innovative. Bottom line: Good communication is good business. What other tips can you provide about internal communication? Please share in the comments.